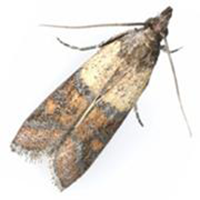 The most common pantry pest that we deal with is the Indian Meal Moth. The first step in managing an Indian Meal Moth problem is inspecting for and then removing all infested food products. The list of products to check includes milled foods such as flour, pasta, cereals, cornmeal, crackers, spices and most commonly, dry pet foods including bird seed. Other sources to check include under shelf paper, behind labels on canned goods, dried fruits, dried flowers, nuts, and even decorative wall hangings containing food products such as beans or spices. Be sure to check areas other than the kitchen or pantry where these items may be stored. Once the suspect food or foods have been identified and removed, thoroughly vacuum the corners of all cabinets and shelves or any area adjacent to the food storage area using the crevice tool attachment to remove any insects living in those areas. As a precaution, take the canister to the outside trash receptacle and dump there to avoid any chance of larvae hatching in the vacuum cleaner and re-infesting your home. Once this has been done we can then treat the interior of the residence for the adult moths.